November | 2013 | A year volunteering! I didn’t end up going to Yoro with my friend for the weekend of the elections… I came downstairs for breakfast on Saturday morning and told my host mum I was going away with my friend and coming back Sundaybut she quickly advised me not to. She insisted it was too dangerous and risky and if I really wanted to go, she wanted me to phone my parents in England too and ask them for permission – but I knew if I mentioned the Word ‘dangerous’ to my mum she would put a stop to my plans straight away too. I am also really close to my host family and I have so much respect to my host parents, they really are the most lovely people, so I decided to stay in Tegus. On Saturday I headed to el centro with Julia and her host sister – she is only 9 years old and it was her first time on a rapidito bus. Julia had a slightly awkward moment when her sister noticed a sticker on the bus saying ‘I love’ before a diagram of a couple doing the dirty. I guess the buses are that child friendly. Anyway, after lunch and doing some errands I headed home to finish something I had been making for my host sisters – I will post a pic soon! This is the ballot for the presidencial candidates but, in Tegus, they were also voting for local candidates – and there were a lot. 23 for each party to be exact. So the sheet was huge and had faces of every person. My host sister told me that you have to be sure to pick all 23 candidates or the people that count the votes could easily put more ticks against people they are supporting. I know when I voted that I only voted for the prime minister and left the rest blank – but there would never be any chance of someone filling out the rest! It’s kind of a selfie craze on the day with everyone posting pictures on Facebook of their black finger to show they have voted… maybe it will catch on in the UK one day! It was really interesting to see the little differences between how the UK and Hondurans vote – ICYE nearly didn’t let volunteers come to Honduras this summer due to the elections but I’m so glad I was here for them and got to experience it. It has been really interesting to see and I have found myself getting really caught up in it, more than I do for elections at home! Like England, there was a TV channel that broadcast the whole voting process showing people across the country putting their ballots in the boxes. I was with my host sisters, host dad and Julia watching as the results began to filter through. I can only think to compare the feeling I had in my stomach as the same as getting my degree results – it felt like the whole thing had been going on so long and there was such a big build up, and so we would know the results and that would be it. I was feeling really tense – I can only imagine what Hondurans were feeling. Around 9pm they announced the first 25% of the results – Juan Orlando was ahead. And he was ahead enough that it was unlikely to change no matter what the other 75% of the voting population decided – he had won. I went to bed at this point as I felt pretty down about it. I have been trying to be neutral through the elections but I have to say, from my point of view at least, Juan Orlando is not the right choice for Honduras right now. He was part of the government that threw out Zelaya and started a period of political instability. He had already broken the law by being head of congress and running for president at the same time. And he is blue – he will help the rich get richer and the poor get poorer. Therefore, widening the gap between rich and poor – which will inevitably cause more instability and violence; which is exactly what Honduras doesn’t need. I can’t say who would have been better for Honduras but I feel the result of the election will not bring good things for this beautiful country. Juan Orlando insists he will ensure more security by putting a policeman or solider ‘on ever cornor’ – but with it being commonly known police are often corrupt and soliders demonstrating excessive violence, I can’t help but think this isn’t a step in the right direction. In the end, after many people predicted the main losing party would do something drastic, there were some demonstrations by the Libre party the day after the elections, but only a few and they were mostly peaceful. It was safe to go out and live life normally again. So me and Julia headed off to City Mall and went by amarillo bus – the bus that is only 4 lempiras and so has quite poor people on it usually. 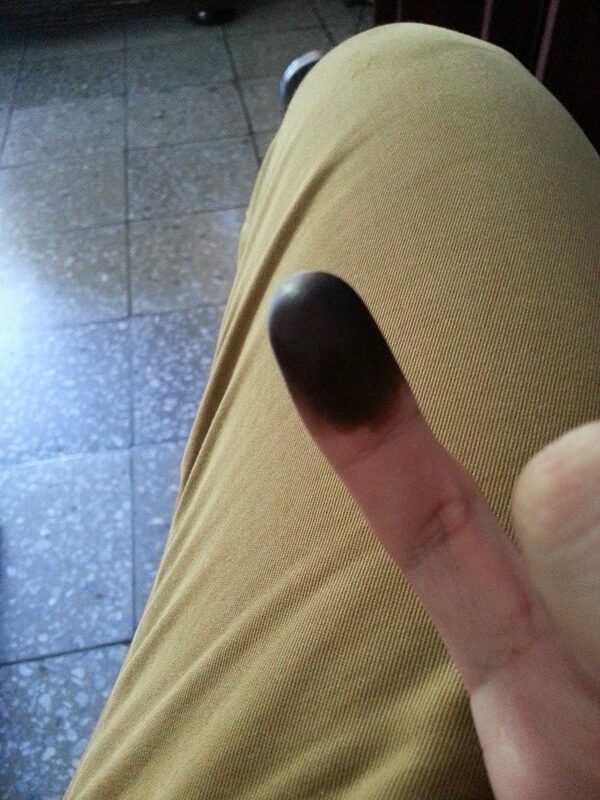 I noticed that I couldn’t see anyone witha blackend finger, to show they’d voted. I was really surprised by this, as after the build up to the elections, I assumed that a huge number of people would vote. I asked my host family that evening and they told me that, in the end, just under 2 million people voted. The population of Honduras is 8 million, with around 5 million registered to vote (it has a very young population so many are under voting age). They said this was a good turn out and the highest they had had – but to me it seemed low after how passionate everyone seemed about the next leader. But my family told me that, due to the high level of poverty in Honduras many people don’t have the means to get to the voting polls, the education to realise voting can change their country or the knowledge to know who to vote for. I think this is really sad as the people who need help the most are failing to have influence on their country’s politics – it is also likely that, if this people did vote, they would likely not vote for Juan Orlando’s party. They would vote for a party that would do more for those in poverty. So those are my views on the elections – I really tried to be impartial during them but it’s difficult not to get swept up in the drama of it all. Today, all anyone can talk about in my project is the elections. The director even told them off for talking to much and not working! But people are so passionate about politics here, which is great – it’s such a shame their new leader is someone only a third of them want. It is only 2 days until the Honduras elections… and you would be pretty clueless to not know it. You can’t go anywhere without seeing about a hundred posters of different candidate’s faces. You can’t go on a bus without hearing a song about a candidate. You can’t sit with a group of Hondurans without the conversation quickly steering to who is going to win. It is drastically different to our approach to politics in the UK – in the UK we argue about who is the worst and often struggle to have much passion for any particular party, whereas in Honduras they support a party with an unrivalled passion and insist their party should win. In the UK it is also a social taboo to ask someone who they are voting for… which leads me to always ask people cautiously who they are supporting, but that is quickly followed by confident cheers for their chosen party and a list of reasons why the other parties are wrong. I was driving somewhere with my host mum the other day and we went past a campaign tent of her party with a big picture of their leader waving in the wind and my host mum honked her horn as we went past and screamed ‘wooohooo’ out of the window as the campaigners whooped back at her. Can you imagine a David Cameron tent surrounded by people cheering? Or Ed Miliband… Nick Clegg maybe? I didn’t think so. It is so different here but it’s a lot more interesting. Even though I’m not supporting a party and I will have left Honduras by the time the new president is in charge, it is hard not to get caught up in it and get apprehensive about who is going to win. Obama is in the middle with the faces of all of the presidencial candidates around him – the main 3 are Villeda (on the far left), Xiomara (to the right of Obama with her hubby Mel Zelaya) and Juan Orlando on the far right. 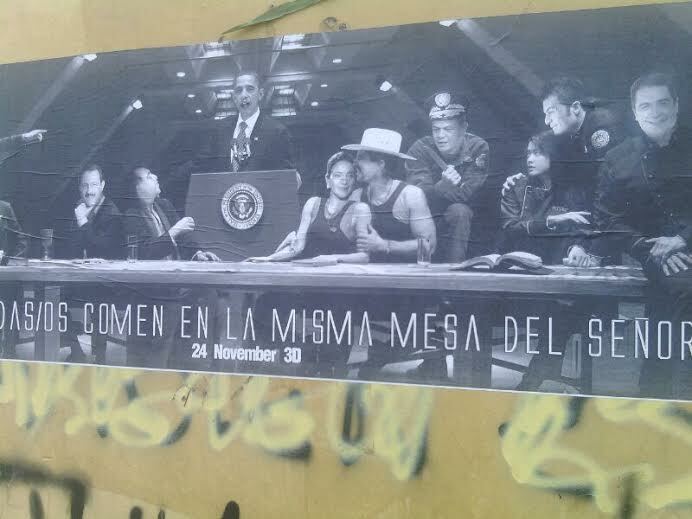 The caption below says “Todas/os comen en la misma mesa del senor” – which means “They all eat at the same table as the sir” and below is the date of the elections. Basically, it is saying that it doesn’t matter who wins as all the money Honduras has comes from the US and therefore the president will be fed by Obama, regardless of whoever wins on Sunday. There was a huge crowd gathered around this picture with everyone debating it. Seriously, Honduras is fascinating. The atmosphere has also become quite apprehensive as the elections approach – we have been recommended by ICYE to stay indoors on Sunday and, if we do venture out, to make sure we wear nuetral colours not associated with any particular party. A friend told me her payday was today, 2 days early, so that she could buy supplies like food and water, in case something happens and people can’t leave their houses. I am going to the north of Honduras with a friend to visit his family – when I told someone at my project this, she looked so worried and made me promise to send her regular updates that I’m OK on Sunday. Obviously from all of the build up I’ve seen and how passionate people can get about the politics here I know it will be a tense day on Sunday, but to me… it all just seems a bit crazy. Hopefully the actual day will be a lot calmer than some people are predicting. One of my friends even told me that she was sure if Xiomara wins that she won’t last a day and she will be taken out of the country, much like her husband 4 years ago. I will keep you all updated next week…! One of my favourite things about my project is that it doesn’t just teach its participants subject matter – they teach skills as well. And part of this is training the older teenagers to be tutors so that they can pass on their knowledge to younger kids in the project. In my first week in AYO, my first market visit was to see two 16 year olds teaching three 14 year olds about the importance of knowing our human rights. I knew zero Spanish at that stage so I didn’t understand a word except for ‘derechos humanos’ but Hector was there and as he speak English he told me a lot of what they were saying. It was amazing – they were so passionate about the education of human rights and why it is particularly important in Honduras. It was so great to see people that age talking so passionately about a subject that gets ignored a lot in the UK – whenever I used to tell people in the UK I was studying human rights they would make a face of surprise, followed by a face of ‘what’s the use of that? ?’ So it really re-inspired (if that’s a word?!) my passion for human rights and how vital it is in developing countries, like Honduras. Anyway, back to the point… as it is coming up to the end of the year, my project took the tutors for a day out to thank them for their hard work. So we piled into an amarillo bus yesterday and headed to a sort of park outside of Tegus to relax, eat and play! The first thing we did when we got there was to go around the tutors and from each market or community, one person would say what they had learnt from being a tutor. One thing I have noticed about Honduran teens is that they have so much more confidence than teens in the UK – they love an opportunity to talk in front of their peers and make everyone listen to them. Hondurans also generally speak with a lot more passion and vigour than we do in the UK so I just love to watch them talk sometimes because their mannerisms are amazing! It was then lunchtime and free time – the park had a pool so a lot of people went swimming while others went for walks around the pretty ponds, lakes etc. After lunch, they also put some music on with included some reggaeton and, maybe unwisely, I decided to show off my moves to all the students, as well as a lot of other people enjoying the park. It was hilarious though as all the students started chanting my name and cheering me on – I’m going to miss them so much! They have the name ‘Jessica’ or ‘Yessica’ in Honduras but they don’t use the nickname ‘Jess’ so the students love randomly shouting Jess all the time, and my colleagues in my project call me ‘Jess Jess Ingles’ (English) all the time, I love it 🙂 And in the last hour the staff had a huge debate about politics which was entertaining as always… more on that in my next blog! Sadly, it was then time to leave… I really didn’t want to say goodbye to a lot of the students as we aren’t going to some of the markets any more as schools are closing for Christmas. I thought I had my last week at my project the week before I left Honduras and then I could say goodbye to everyone, but it turns out that my project comes back to work the same day as my flight 😦 and it seems too early to be saying goodbye to students as I don’t leave for 6 weeks and I might see them again in the office… but it is really sad to know it will be the last time I ever see some of them 😦 the students that AYO helps are great and I’m so glad to have met them all. It has been almost 3 weeks since I last posted – whoops! But as you might have guessed from the title I did go to Nicaragua and I did manage to catch dengue while I was there (at least, I’m guessing it was there). The day after we arrived back I had a fever and cold sweats and in the week that followed I suffered from just about every symptom dengue can throw at you: muscle and joint pain, vomiting, diarrhea, rash… yeah, not a fun time! Luckily though it was just classic dengue, and quite mild, so I was up and about after a week. But, back to Nicaragua… we took 4 buses and passed through the capital, Managua, to get to an old colonial town called Granada for the weekend. It was super pretty and reminded me a lot of Antigua in Guatemala – the cobbled streets, old colonial style houses and every street having about 5 cafes each. During the weekend we had a lot of yummy food, a boat tour of the lake and a night of dancing with both foreigners and some locals. And I even got to see Julia perform in a John Lennon bar we found. 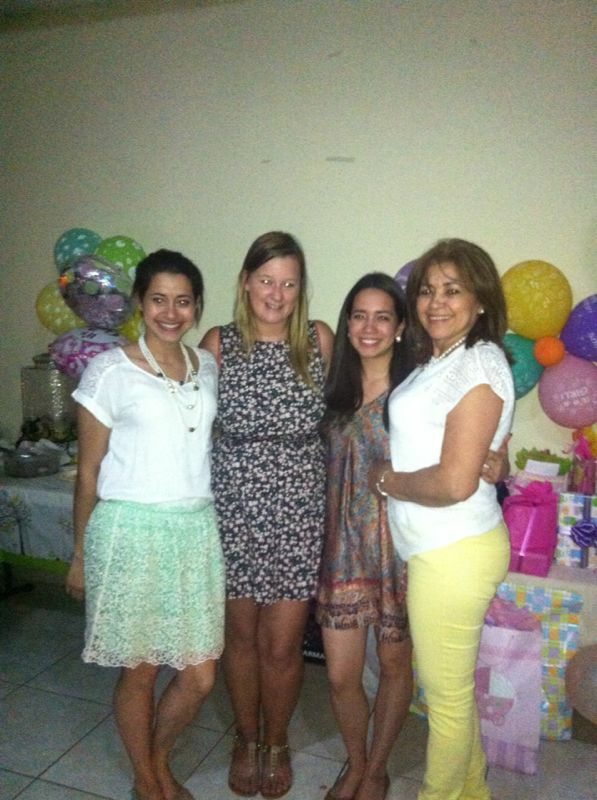 This weekend we also had the baby shower for my sister in law, Maresa, as she is giving birth to her first child next month, so exciting! It was a really fun party and, thanks to a game of pass the nappy, I even got to sing some raggaeton in front of everyone!